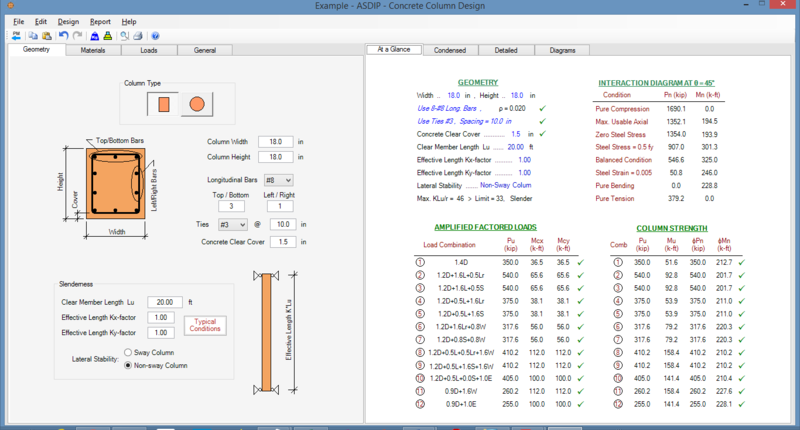 ASDIP CONCRETE is a structural engineering software for the design of concrete members. It includes the design of biaxial columns based on the ACI 318 provisions. 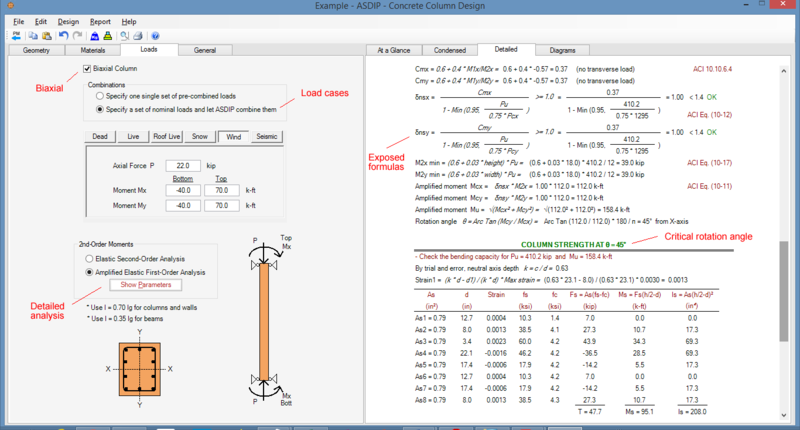 This document is a step-by-step design example of a biaxial slender column using ASDIP CONCRETE. As an example, consider the 20 ft long non-sway square column shown below, which is part of an office building. The lateral loads will be resisted by shear walls, but the columns will have wind end moments due to deformation compatibility. 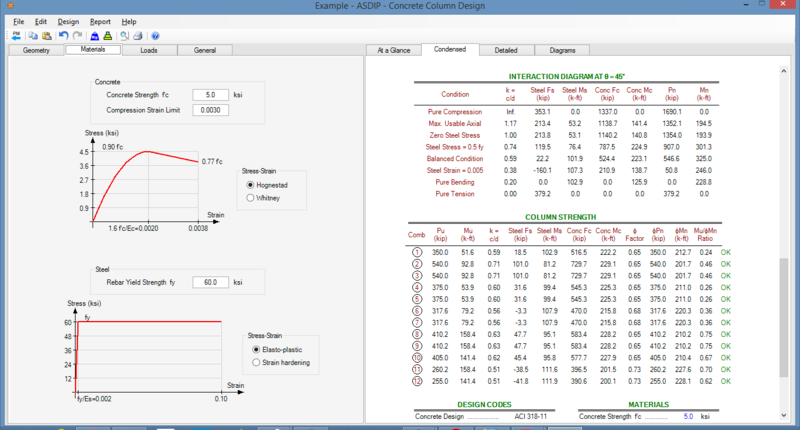 Design the column reinforcement for the loads shown. Amplify the moments due to second order effects as required per code. Assume conservatively kx = ky = 1.0. 1.- Enter the geometric dimensions of the column. In this case, the column is 18"x18" due to architectural requirements. As a first trial, use 8 #8 rebars, which is about 2% of the gross area, larger than the 1% min. The At-a-Glance tab shows a summary of the design for a quick overview of your work as you go. 2.- Enter the material properties, such as the concrete and reinforcing steel strengths. Since this is a heavily loaded slender biaxial column, use f'c = 5 ksi. The Condensed tab shows a more complete set of results grouped by topic, great for a more detailed overview of your design. 3.- Use the Loads tab to enter the loads on the column. In this example the loads are given per load case, as shown in the figure above. Note that the applied top and bottom moments have opposite sign, indicating double curvature. Check mark the check box indicating a biaxial column. The specified loads do not include the second order effects, so the resulting moments will be amplified. The Detailed tab shows a complete set of calculations with exposed formulas and with references to the ACI code. 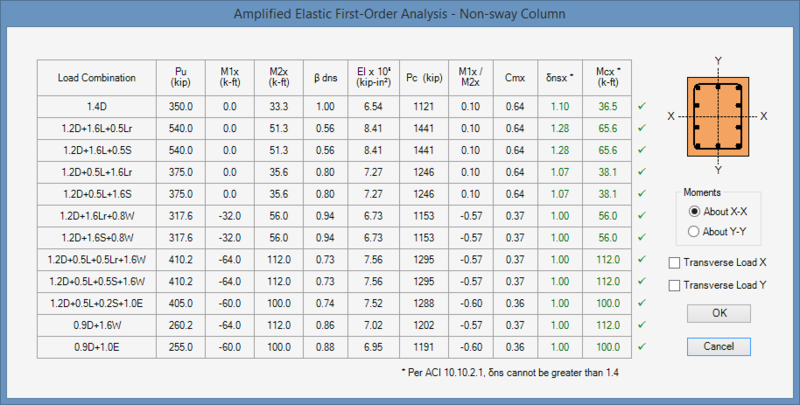 4.- Click on the Show Parameters button to see a detailed table with the Amplified Elastic First Order Analysis. Note that the moments were amplified between 0 and 28% for the different load combinations. ASDIP CONCRETE shows graphically the interaction diagram with the loads represented as dots. The diagram will be generated for any rotation angle. 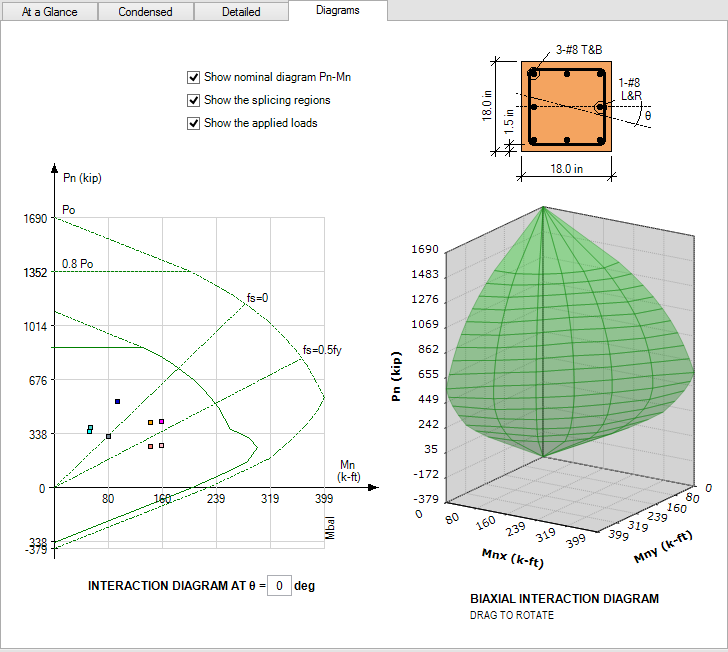 In addition ASDIP CONCRETE generates the 3D interaction diagram. In this example all the loads are inside the usable area of the diagram, therefore the column capacity is adequate as designed. ASDIP CONCRETE includes the design of biaxial slender columns, with multiple options to optimize the design easily. The moments may be amplified quickly to consider the slenderness effects. This example shows that the column design can be completed and optimized within minutes. For engineering background, please read my blog post "Concrete Columns: Structural Design Overview". Detailed information is available about this structural engineering software by visiting ASDIP CONCRETE. You are invited to download the Free 15-day Software Trial, or go ahead and Place your Order.